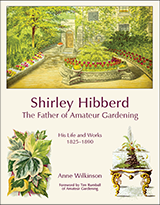 Although Shirley Hibberd lived in several different parts of London, Stoke Newington is the place most associated with him and where his best known garden was. It is now a prosperous and popular residential area, particularly favoured for its classic Victorian houses, its proximity to Clissold Park, recently renovated to a high standard, and the lesser known Abney Park cemetery, now a dedicated nature reserve. When Shirley Hibberd arrived there in 1857 it was on the point of changing from a village to a commuter suburb and in his writing he documents the changes that occurred and the reasons why he left. He had known the area for some years and several of his wife’s family lived in surrounding areas. The house he moved to, 6 Lordship Terrace, was a large semi-detached house built in the 1820s and the street itself was then called Meadow Street. Shirley Hibberd saw the house and its long garden as a rural retreat that would be in a milder situation than where he had previously been living in Tottenham, further north and nearer the Lea valley. Some buildings that we see today were there at the time. 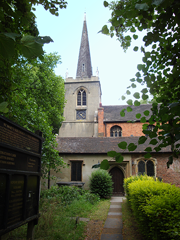 The old St Mary’s church, under the shadow of which he describes his new house as being, was built in the 1500s and was still in use. Now it is not used for services, but is part of an arts centre, and is used for concerts and exhibitions. The graveyard has a very rural feel and in the spring is full of snowdrops and daffodils. The ‘new’ church across the road was just finished at the date Shirley Hibberd moved in. Its large size reflected the growing congregation of the area and its design was by Sir George Gilbert Scott who designed St Pancras Station and the Albert Memorial in Hyde Park. The difference in the church from its appearance today is that the spire had not been built. That did not appear until 1890, so Shirley Hibberd is unlikely to have seen it. Even without the spire, it would have been an imposing building, but nothing like the landmark it is today. Stoke Newington was surrounded by nurseries in the 1850s, so it was easy enough for Shirley Hibberd to buy plants and find gardeners to write for him. He chose experts in all fields, some amateur, some professional. 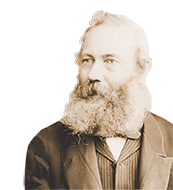 Robert Oubridge was a successful nurseryman who eventually set up business in Queen Elizabeth’s Walk, just round the corner from Shirley Hibberd, and now bordering Clissold Park. William Chitty was a florist, one of two brothers, who lived in Birdcage Walk, eastwards off Stamford Hill, now Windus Walk, with The Birdcage pub in Windus Road keeping the name alive. The garden in Lordship Terrace was over 300 feet long, so it provided Shirley Hibberd with plenty of scope for growing things. However, once he started his gardening experiments, it was not enough, and because most of the Victorian houses we now see had not then been built, he was able to rent plots of land to use. The principle ones we know of were in Queen Elizabeth’s Walk, before Oubridge took over, and in the area between Lordship Road and what is now Yoakley Road, probably where the school now stands. 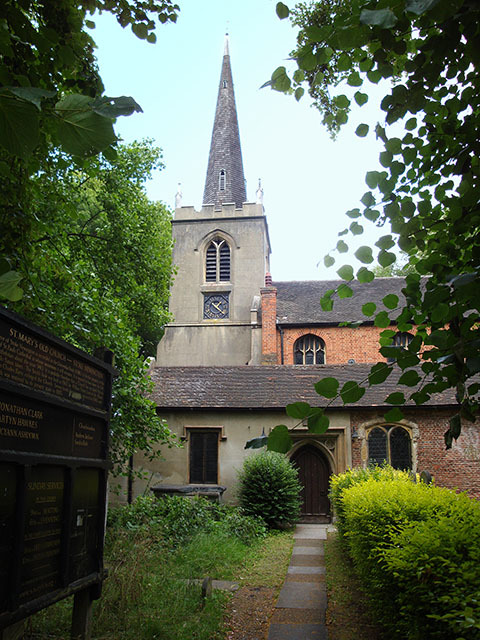 As well as the churches, buildings that still exist from the time of Shirley Hibberd are the watch house behind The Lion pub on the corner of Lordship Road and Church Street (then The Red Lion), and three large houses in the High Street, then known as the Market Place. One was the Invalid Asylum, now Yum Yum restaurant, next door was the Dispensary, now Trayman’s solicitors and finally, Mr Pickburn’s house, set back from the road. All three had large gardens running all the way back to Abney Park Cemetery. The Dispensary was run by Dr John Denny, who became a keen member of the Pelargonium Society, and who Shirley Hibberd mentions in several different contexts. 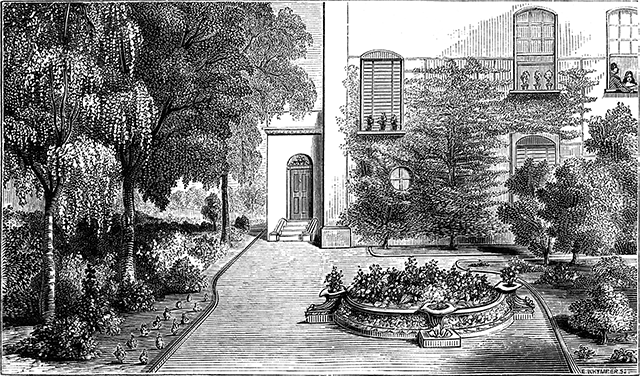 Mr Pickburn was also a keen gardener and built an eccentric combined plant house and smoking room that is featured in Shirley Hibberd’s book The Amateur’s Greenhouse. Abney Park Cemetery was still relatively new when Shirley Hibberd came to Stoke Newington and he soon bought a plot there for himself and his family. In the event, both his wives were buried there before him. It was originally laid out as an arboretum by Loddiges Nursery and now is a nature reserve, which Shirley Hibberd himself would be proud of.